These are very simple demos, using the same repeating sequence, in order to demonstrate how the various different modes on the Sputnik Modular Quad VCF/VCA lowpass gate can sound. All demos also use the Quad Function & Trigger Source. This first demo is simply to show what the Sputnik Quad VCF/VCA (a Lowpass Gate) sounds like in its naked form. No effects or processing was used. It was only used in COMBO mode (where it attenuates both high frequencies and amplitude, like a lowpass gate). 3 Waves (Sine, Double Pulse and Sub) from the Rubicon were mixed in a Manhattan Analog Mixer. At points a Dixie Sine wave was used to modulate the PWM on the Double-Pulse, at varying frequencies. The Sputnik Quad Function & Trigger Source provided the short envelope which opens/ pings the lowpass gate. This was a particularly exponential shape, produced by sending the output of the envelope into a bipolar mixer – with the signal inverted – and then feeding a moderate level of this inverted signal back into the envelope’s Decay CV input. This turns it from the default linear shape into an almost identical clone of the fantastic Make Noise Maths exponential curve. This envelope channel was set to output +8v – which can be set via a switch on the PCB (either +5v or +8v). It was fed into the Lowpass gate’s CV input. The output was recorded direct. Throughout the recording I manipulated various controls, in order to give an idea of how the lowpass gate responds to different signal levels, types of waves, and different length envelopes. I used sines at points to demonstrate whether it overdrives at higher input levels. Towards the end I manually adjusted the cutoff/ bias control on the lowpass gate, to show how it responds to slower modulation. Right at the end I flicked on the Cycle switch on the envelope, and drove it into audio rates. Well, you’ve got to really, haven’t you? All in all I’m pretty impressed with this module. I have tested every output and input and have noticed no issues with it. It does the “Buchla Bongo” admirably well in my opinion, and is probably cheapest way to put 4 lowpass gates into your system. When combined with the Quad Function & Trigger Source, you’ve got a hell of a lot of timbral and rhythmic bases covered. This demo is simply to show what the Sputnik Quad VCF/VCA (a Lowpass Gate) sounds like in VCF mode. No effects or processing was used. This effectively turns the channel into a simple vactrol-controlled lowpass filter, with a lovely “woody” tone to it. Essentially the same as Demo 02, except that this time the envelope from the Quad Function & Trigger Source is mixed with the same 1v/oct sequencer output that is controlling the pitch of the Rubicon. This sequence is mixed with the envelope in the two middle channels of Maths, which is serving as a bipolar mixer. At various points the envelope and/or sequence are attenuated and inverted against each other. The main cutoff/ bias control on the VCF/VCA is also tweaked to accommodate these varying settings. I have left a portion of “silence” at the start, in order to demonstrate how well the VCF closes when no CV source is applied. There is typically a bit of high frequency bleed in vactrol filter designs, but I think this amount is very acceptable. This is the same level as in COMBO mode. The VCA is even quieter when closed. The first thing I do is gradually turn the main cutoff/ bias control through its range, to demonstrate the effect this has on the sound. Various controls are tweaked during the recording, and PWM is applied to the Rubicon as things progress. The frequency of the Dixie is manipulated, as is the balance and overall level of the waves feeding the VCF. Higher levels add a pleasing fatness to the sound. The final demo of this little set serves to demonstrate how the Quad VCF/VCA responds when in VCA mode. 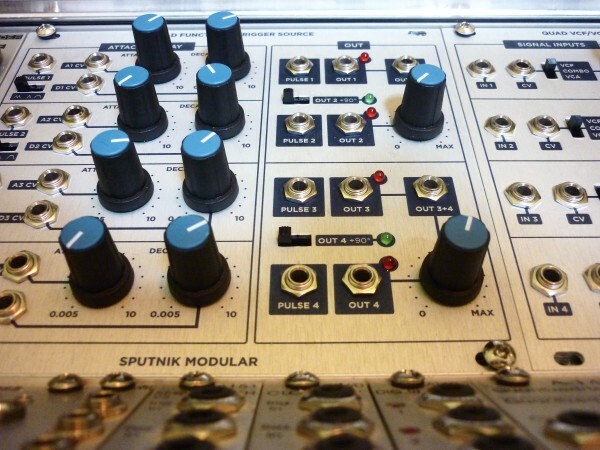 In this mode the module merely acts as a simple vactrol-controlled VCA. I have used nothing other than a single sine wave throughout the recording, in order to demonstrate the effect that the various settings and modulation inputs have on the sound. The patch is similar to the previous two, with the Dixie providing audio rate modulation. Essentially the same as Demo 2, except that this time the envelope from the Quad Function & Trigger Source is mixed with the Dixie’s Sine wave output, to provide amplitude modulation (AM) into the Quad VCF/VCA’s CV input. The Dixie is following the same 1v/oct sequence as the Rubicon’s sine wave. The Dixie’s audio rate modulation is not introduced until 01.27, where is is blended with the envelope in a mixer and fed into the Sputnik VCA. Again, I have left a portion of “silence” at the start, in order to demonstrate how well the VCA closes when no CV source is applied. I think it is pretty damn quiet personally. I have had dedicated VCAs that have bled far more than this. This is followed by increasing the level of the envelope fed into the VCA’s CV input. The Dixie’s AM is then introduced and its frequency tweaked, demonstrating how the VCA responds to different rates of AM. During the recording I also experiment with varying levels, VCA bias settings, along with envelope decays and levels.